They respond to emergency calls from the public, often putting themselves in danger in order to save lives. They perform CPR, deliver babies and comfort victims of traumatic events. They work behind the scenes in an often thankless job. And they are all volunteers, with their own busy lives, children and challenges…writes Eliana Rudee/JNS. Yes, super-heroes exist. Or rather, super-heroines do. And they exemplify what it means to be a woman giving back to her community in spite of incredible odds. Dana Atias is a divorced mother of three, living on her own with full custody of the kids. Since her service in the Israel Defence Forces, it was always her dream to be a medic. But during that service, she got pregnant and had to drop the training course. So she waited until her oldest child was old enough to watch over the younger ones in case Atias needed to run out at a moment’s notice. Now, 13 years later, she has finally achieved her dream. During the day, Atias works as cosmetician. In fact, she often works until 11 p.m., so the day job is actually a night one, too. Despite such a schedule, she finds time at least once or twice a week to volunteer on ambulance calls or at Tel Aviv’s Sourasky (Ichilov) Medical Center. In addition, she has made it a policy for herself to respond to emergency calls 300 meters or less from her home, even when she is in a meeting with a client. As the only breadwinner for her household, the 32-year-old tries to limit the number of times she goes out on calls. If it were up to her, she said, she would volunteer all day and wouldn’t earn any money at all. Atias loves responding to emergency calls; it reinvigorates her, allowing her to better feel the cycle and magic of life. “It gives me a high,” she said. “My kids call it the ‘woo-woo’ application [because of the sound that the ambulance and app makes when I receive a call]. I ask them if I can turn it on when I get bored or tired. Sometimes, they come to me and say, ‘maybe you should turn on the ‘woo-woo’ application!’ because they know when I return, I come back wanting to teach them, cook for them and play with them. Going out on calls gives me more value for life and makes me take nothing for granted,” she explained. Atias recalled a particularly emotional day, which happened to fall on Feb. 14, Valentine’s Day. She got two very contrasting calls—one, a story of love gone wrong, a call about domestic abuse of a 20-year-old young Eritrean woman in south Tel Aviv; and later, love gone right, a call from another Eritrean woman giving birth. “I knew exactly what to do, and I delivered the baby,” said Atias. “It was a perfect day! After the tragic first call, I felt like God gave me a present, saying, ‘it’s OK, everything will be OK.’ And when I held the baby, I felt like I had won the lottery. It gives me fulfillment to help others,” affirmed Atias. 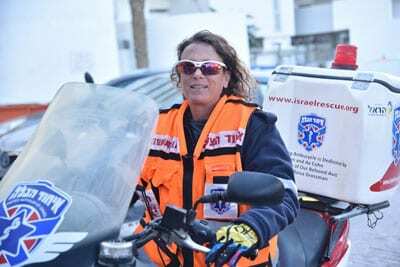 Sophie Donio is a single mother and United Hatzalah’s first female ambucycle responder. Originally from Paris, she moved to Eilat 28 years ago, and works as a founder and diving instructor at Dolphin Reef Diving Club in Eilat. There, she founded the program “supportive experience with the aid of dolphins” for children 6 to 16 years old who face various challenges and mental difficulties, such as post-traumatic stress disorder, autism, dyslexia, Down syndrome, depression, cancer, sexual abuse and behavioral problems. In addition to this work, last August she took blind people around India on tandem bikes, organized by the Adventures Beyond Borders Foundation. She continues to ride tandem with blind people in the center of Israel. She holds a master’s degree in psychotherapy, has published her own research and is a dolphin trainer. In addition to this work and taking care of her two sons, she also finds time to volunteer as a first responder. She spoke of one particularly challenging call, performing 40 minutes of CPR on a 14-year-old girl who was unresponsive because of a fever. They were able to resuscitate her, but later, she died in the hospital after her systems collapsed. Donio later found out that the girl had swine flu, and she had put her own life in danger by touching her. In addition to saving lives, the 52-year-old’s work with Hatzalah is breaking barriers. As the first woman to have a motorbike, Donio is trailblazing a path for other female first responders. She noted that because Hatzalah is a religious Jewish organization, rabbinic discussion ensued over whether or not it was modest for women to ride a motorbike. He told JNS that “once I heard that Sophie wanted to join the ambucycle unit, I said to all involved that we must make the regular process much smoother and expedite the process for her as she is our revolutionary in this field. She is the first female volunteer of the organization to ride an ambucycle of ours, and I want many others to follow her.